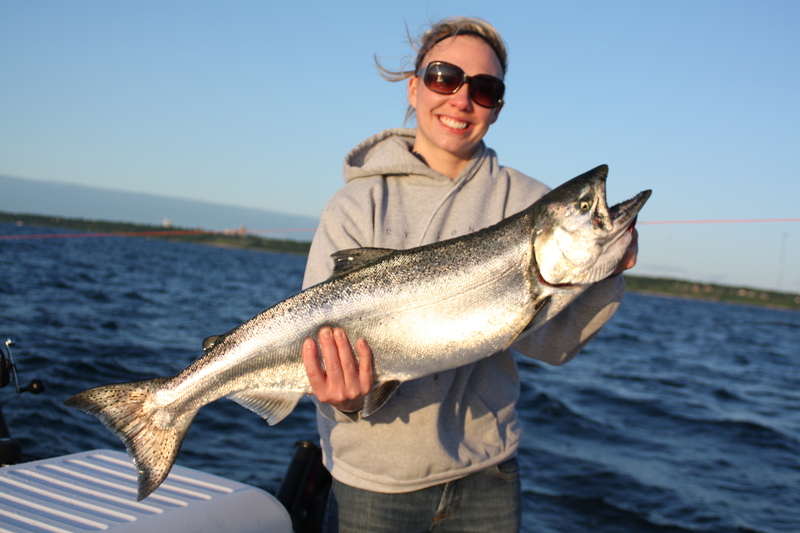 Chinook Salmon are called Kings for a reason, they are the largest and fiercest fighter of the different salmon species. They are the most highly sought after game fish in the lake, and my personal favorite salmonid. 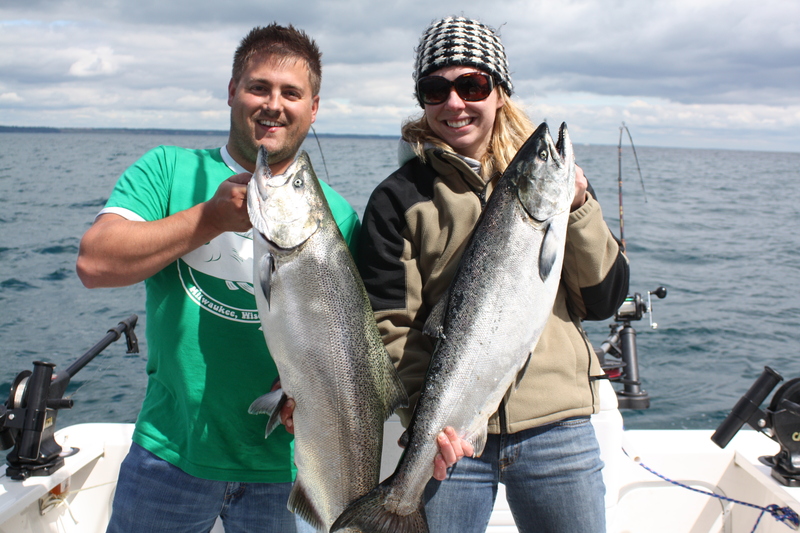 Kings can be caught from April through October, but the best fishing is generally from late June through early September. 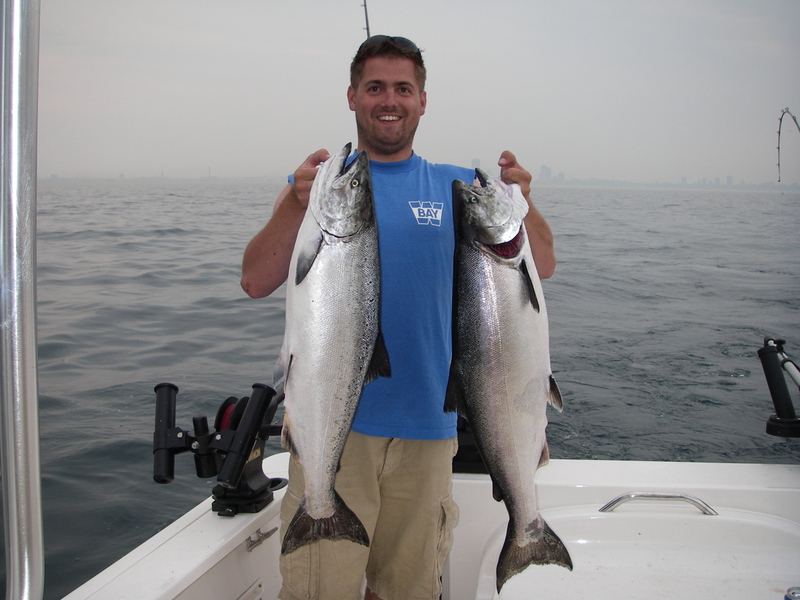 By mid-June King fishing takes off in most ports around the lake. 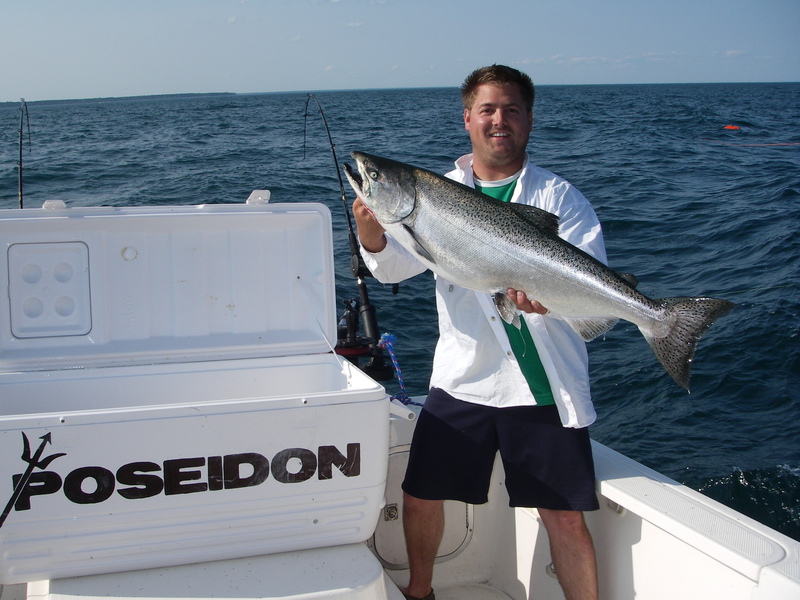 Kings can be found throughout the lake, and are the dominant fish caught in most ports on Lake Michigan from July-September. So how do you target Kings? First realize that King Salmon are eating machines, it's not possible to reach the size they achieve in less than 4 years by being dainty. On the water the first thing to look for are large schools of alewives. Not far behind the alewives should be cold water since large Kings prefer 44-49 degree temps to rest and feed in. Now this is not an absolute by any means, Kings will tolerate warmer water while feeding. Kings will raise to strike baits in temps of 60 degree or more especially at peak low light times. Make sure you have cold bottom temps in the 50 degree and below range, because without at least 10ft of cold water you're not going to have a lot of kings. Only exception being later in the summer when mature kings start cruising out of temp looking for their natal rivers. While temp is important, remember the number one thing driving King location is bait! First fish the bait, if you can't find the bait then fish temperature. King salmon have great senses and are very powerful swimmers. They can easily see and feel the commotion of a flasher or dodger from a great distance. A King in the witching hour of daybreak will think nothing to raise 40ft or more through the water column to crush a bait. This overwhelming drive to eat is why you can catch Kings on your high lines, in water as warm as the mid 60's. That said, having a couple high lines early or late in the day is always a good strategy. Now, if you want to catch salmon after the first light feeding binge than you'll most likely need to drop your lures down into water that is 45-49 degrees. Getting suicidal Kings to hit at daybreak and sunset is really pretty easy, but catching them from 9AM-5PM can be quite a trick. For this article I'll focus on a midday strategy. I'll look at low light strategies in another post. Kings are the most boat shy and moody fish in the lake during mid-day. They are extremely light sensitive and prefer to feed in low light. To have constant mid day success concentrate on finding 45-49 degree water and slow way down....or speed up! Kings are not actively feeding during the heat of the day so stick to fishing their comfort zone and you'll find Kings. Often times you'll have to slide out deeper as the sun rises to stay on a good bite. I mentioned slowing down or speeding up, let me elaborate. By slowing down you are playing to the Kings lazy nature. For the most part Kings are in no mood to chase down a meal so the slower you can go and still keep your gear fishing properly the better. On the flip side speeding up to 3mph works as well playing into the Kings predatory nature and forces the fish to make a decision quickly before an easy meal gets away. While they are opposite schools of thought both work and should be tried daily. As long as the fish aren't in super shallow (40 ft of water or less) than I like a spread that's heavy on flasher/flies. Flasher/flies are the number one King producer on my boat, bar none. I think the reason flasher/flies work so well lies in their attraction power. The thump of the flashers draws Kings from way off into the spread. I generally run a nine to twelve rod set depending on crew members, most days it would be rare for me to have less then six of the rods fishing flasher/flies. The remaining rods completing my set are loaded with spoons or J-plugs. Let the fish tell you what they want on any particular day and load up on it. What ever spread of lures you run make sure they work at the same speeds. Example, don't run heavy spoons when you're running dodgers at slow speeds looking for Lakers. Most of the year we run 8" flashers with flies on 24"-28" leaders (measured from the rear hook to the end of the mono loop), but as the season progresses, a single large 11" paddle with a fly leader of 36"-40" can be dynamite if the fish slide deep. So what trips a Kings trigger? Below are a list of some of my favorites, but honestly and truthfully this changes year to year and day to day. 1. White/Glow Pro-Troll or Hotspot Flasher with a Bullfrog, Naughty Leprechaun, Super Frog, or Naughty Frog Poseidon fly. 2. Chart/ Double Glow Pro-Troll Flasher with a Milwaukee Minnow, Bad Apple or First In's Fire Fly. 3. Mountain Dew/Crushed Glow Spin Dr. with a UV Supernova, Purple Mirage or Mirage-Frog. 4. UV Chrome Flashers like Salmon Flute, Glowsicle or Chrome Super UV with a Naughty Leprechaun, K-Bear, Super Frog, or Smooth Operator. 5. Fishlander "Electric Koolaid" - Magnum Size Lastly I like to run a spread consisting of no more than 9 lines for shy mid-day Kings. I run two riggers spaced at least 15 feet apart with flashers/flies. Just outside and above the riggers are two wire divers fished on a 2-3 setting with flashers/flies. Make sure to run a snubber on your wire rods and run a 10-15ft mono leader behind your Dipsy, the longer you can get away with the better. To round out the eight rod spread I run leadcore or copper off planer boards with spoons, plugs or flasher flies. As the summer progresses I'll go into more depth about each of the above techniques and look at an early morning glow strategy. Good Luck out there. I generally hook the Spin Dr up to the less action hole which is the one by the fins. I also use the front hole for the faster speed. I think the bigger Kings like the slower fly speed. I always use a 24" leader on these.